Wedding is a big event when the new couple is visited by many relatives and endowed with blessings and gifts. A wedding thank you card is normally sent by a newly married couple express gratitude and thanks to those who attend their wedding or send gifts to them or some special people who help them make their big day memorable. It doesn't require much time to write a wedding thank you note after your wedding, but it shows your appreciation for those thoughtful presents and help. So it is important to send good wedding thank you cards. 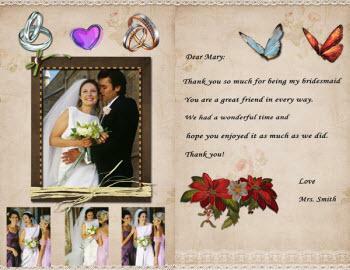 Here are some tips on how to write a perfect wedding thank you card. If you had a very large wedding, you may need to write a lot of the wedding thank you notes. First, make a list of receivers’ name and address in case that you may overlook any one. And make sure you buy some good quality stationery that you feel happy writing with. You can also set up the printer to print out the thank you wording if you have bad handwriting. Usually, a personalized wedding thank you card is expected, and a great idea to make the thank you card customized is to attach a picture of your happy wedding or honeymoon to it. To do this, you can use a photo card software with free card templates to make the card personalized with different styles and your photo attached. You friends and family are the most important people in your life. Thank them for everything they have done for you with the wedding thank you card. Thank you so much for the gorgeous lace tablecloth! It is beautiful and we were both incredibly touched that you gave us this family heirloom. It was wonderful, as always, to see you at the wedding – I especially loved jitterbugging with Uncle Joe. I can't wait to catch up on your news and tell you all about the honeymoon and newly married life. Maybe you are not familiar with some guests but they sent your gifts and blessings. So thank them, thank all the people who care about you. Thank you so much for the wonderful hand held mixer you gave to us at the wedding. He will certainly love it when I make his favorite mashed potatoes with it. It was so exciting to us that you two were able to share this special day with us. Your bridesmaids help you plan the wedding so that everything goes well. They are good friends. Say thanks to them! Thank you so much for being my bridesmaid. Having you by my side made my wedding so special. You are a great friend in every way. We had a wonderful time and hope you enjoyed it as much as we did. The sender didn’t come to the wedding, but you should let him/her know whether you received his gift and how your liked it. Thank you so much for the gold-plated doodad you sent Christine and me as a wedding gift. It was so thoughtful of you! I'm so sorry that you couldn't attend the wedding – it was romantic and went just as planned. I'd love to get together soon so you can see the pictures! It is not necessary to mention the amount of the gift but you should use the wedding thank you card to tell the givers how you used the money and express your thanks. Thank you for the check you sent for a wedding gift. We are saving to buy a new car, and your gift will help us reach our goal. We can't wait to take you for a spin around the neighborhood. Maybe some gives you a gift, but you don’t like it. Even though, you should write the thank you letter to express gratitude for politeness. Thank you for the wedding present of the velvet painting of dogs playing poker. It is certainly a unique gift; you are always so thoughtful and generous. It was so nice of you to join us at our wedding, and Christine and I hope to see you soon. 1. Send wedding thank-you card within four weeks of returning from the honeymoon, or within three months of the wedding. Do not send it one year later! 2. When writing thank you card, use "you" more than "I" or "me" to show respect. 3. Start each note with a heartfelt "thank you” to express your sincere gratitude. Getting all these things understood? Now begin to make preparation and get Wondershare DVD Slideshow Builder to make personalized wedding thank you cards to show your gratitude for everyone!